Snowflakes are the beauty of winter season and specially during the Christmas holidays when people keep them as decorative for the Christmas. 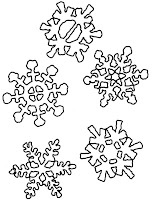 These snowflake coloring pages will give your little kids an idea about how they look like and through colors they will fill the printables. Keep the colored snowflake crystals to decor your child's room, wardrobe and his/her school bag.